are two Americans living in Germany since April 2004. Pumpkin is pretty naturally sweet, so don’t be bashful with the salt and cheese. Heat oil in large deep skillet to medium and bring broth to a low simmer. Sauté shallots and garlic until tender and fragrant. Add rice and stir until coated with oil and starting to smell toasty. Add wine and stir until mostly evaporated. Start adding broth by ladleful, stirring constantly. When the pan starts to look dry, add another ladle of broth. After adding about half of the broth, add the pumpkin, thyme and pepper. Taste and add salt, if needed. Keep adding broth until it’s gone. Once all broth is in, remove skillet from heat, stir in butter and half of cheese thoroughly, cover skillet and let stand for 5 minutes. Serve with cheese for sprinkling. Originally taken from here, but it wasn’t limey enough for my tastes. Also, if I crack open an orange or lemon, I’m going to use all its juice. This is great as a side or as burrito filling. Do the rice in your rice cooker with the bay leaves and salt. Remove the bay leaves when the rice cooker thinks it’s done. Don’t worry if the rice is still a little chewy at this point; it’ll soften up some more if you keep it hot in the rice cooker (the warming setting, or just don’t break the seal). Fluff up the rice and stir in the juices and oil. Add in the cilantro just before serving. I got this one from here and it’s harder to explain than to make. It looks a little intimidating, what with the tempering, but it is quite simple. I suggest you have someone help you with the tempering, but it is possible to do it alone if you have a stick blender w/whisk attachment and a steady hand. In a deep soup pot, heat oil over medium-low heat. Sauté onion and garlic until tender and slightly translucent, 3-5 minutes. Pour in chicken broth and water and turn heat to medium. Bring to a gentle boil and add rice. Reduce heat to simmer and cook for 5-7 minutes. Add salt, chicken, pepper and dill and continue simmering 5 minutes. While the broth is simmering, in a heatproof bowl (I used a large pyrex measuring cup) beat eggs while slowly pouring in lemon juice. Taste a grain of rice; when it’s almost completely cooked, it’s time to temper the eggs. Add hot broth by the ladle (3 will probably be enough) to the eggs while whisking. Once the eggs have warmed up, take the soup pot off the heat and stir the egg mixture into the soup until completely integrated. Serve immediately. Here is a great way to use up leftover rice – although we often make rice the day before specifically for this. You could probably throw in other vegetables, too, but be certain to cook them until they’re no longer releasing liquid. Too-wet veggies will prevent the optimal crispness of the rice. We got the inspiration from Culinate, but (as usual) this version is my tweaked one. In a large deep skillet or pot (or wok, if you have one), fry the bacon over medium-high heat. When the edges are just starting to get crisp, remove all but one tablespoon of the drippings and add the onions, garlic and ginger, stirring constantly, until just beginning to get tender and fragrant. Whisk together the soy, wine, Hoisin, pepper flakes and vinegar and set aside. Add the rice to the bacon mixture, breaking up any lumps and reduce heat to medium-low. Sprinkle the sesame oil over the rice and add the sauce mixture, stirring until well distributed. Let the rice mixture stand undisturbed for one minute. After a minute, lift the layer of rice from them bottom – it should be lightly browned and crisp. Stir the rice so another layer has the chance to crisp and repeat until you’ve almost achieved your desired texture. Push the rice to the side of the skillet and make room for the eggs. Pour the beaten eggs directly on to the surface of the pan and allow to cook undisturbed for 2 minutes. Once a good skin of cooked egg has formed on the surface of the pan, briskly stir the egg, scrambling it in the small space available for it, until you’ve reached your preferred scrambly-egg texture. Remove pan from heat, stir well to distribute the egg and crisped rice bits and serve immediately. We’ve been experimenting with risotto lately. Now that I’m an avowed maker of my own stocks, I occasionally have more than I can store and risotto is a great way to use up 4-6 cups at a time. Plus, the ritual of adding the broth and stirring is strangely relaxing. We stocked up on Arborio and Carnaroli rice on our road trip to Italy, so we’ve got plenty of risotto ingredients. This recipe from the (adorably named) blog Rootie Tootie Fresh & Foodie has been a go-to of ours for a while now. Bring broth to a simmer in a medium saucepan and cover to keep warm. Heat oil in heavy skillet over medium heat. Add bacon and cook until edges are beginning to crisp. 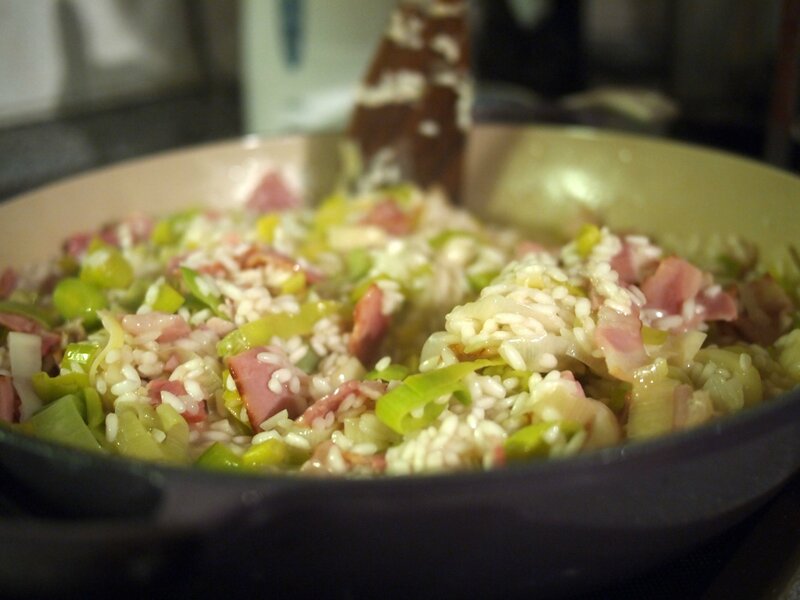 Remove bacon drippings except for 1 tablespoon and add leeks to skillet. Stir leeks frequently (if pan seems dry, add a little more olive oil) until beginning to soften. Add garlic and cook, stirring frequently, for another 2 minutes. 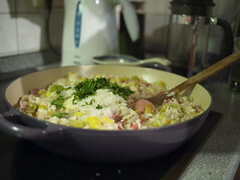 Add rice to skillet, stir well until all grains are glossy, about 2 minutes. Add wine to skillet and stir until absorbed. Add 1/2 cup broth (about 1 ladle-full) to skillet and stir constantly. When most of the broth is absorbed, add another 1/2 cup and repeat this process (always stirring) until rice is tender but firm to bite and sauce is creamy – about 20-25 minutes. When you’re happy with the texture, add the parsley, butter and cheese and salt and pepper to taste. Stir well and remove from heat. Allow risotto to stand for 1-2 minutes before serving. We’d just returned from Italy with all kinds of ideas and experiences and raw materials for good food prepared at home — welcome, after being on-the-go for so much of September, October and November. We had a few lemons (from the Biomarkt) and shallots and garlic to use up, plus arborio rice and Pecorino Romano cheese from our grocery expeditions. The original recipe came from our swell How to Cook Everything app (thank you Mark Bittman! ), but the version below has our enhancements in it. Heat the oil in a large, deep nonstick skillet to medium. Then add the shallots, garlic and saffron, and cook, stirring constantly, until they soften, 3 to 5 minutes. Add the rice and cook, stirring constantly, until it is glossy and coated with the oil, 2 to 3 minutes. Add the white wine. Stir and let the liquid bubble away. Use a ladle to begin adding the stock, a ladlefull or so at a time, stirring after each addition. When the stock is just about absorbed, add more. The mixture should be neither soupy nor dry. Keep the heat at medium to medium‐high and continue stirring. Don’t plan on doing anything else while this risotto is going — you gotta keep stirring it. It’s going to take a while to get to that perfect texture. Plan on an a half-hour, but check it occasionally after 20 minutes. You want it to be tender but still with some resistance upon chewing; it could take as long as 30 minutes to reach this stage. When it does, stir in the butter and lemon zest and at least ½ cup of cheese. Taste, adjust the seasoning if necessary, and serve immediately. Throw some more grated cheese on it, if you like. We used peppercorn Pecorino Romano, so we didn’t need any additional salt, pepper or other seasoning. You will need some of those flavor boosters if you choose a less burly cheese. We found this recipe went exceedingly well with Roasted Brussels Sprouts. We finally got a grill! And we know how to use it and how to make most of the meaty deliciousness we plan on cooking with it. So…um, now what? We need accompaniments to the meat explosion. Nice, vegetabley salads are the next hurdle. We generally don’t do salads that need to chill, due to lack of fridge space, but they go so well with grill fare that we might need to clear out some room. This recipe (original is here – measurements are my own) was the side to our inaugural grill usage and we ate it – and enjoyed it – the same day. However, Cliff took the leftover for lunch the following day and said it tasted quite a bit better after the flavors had time to mingle. If you can plan ahead, make it the day before you plan on eating it. And feel free to tinker with the measurements. I certainly did. Cook rice, according to package directions, and allow to cool completely. Mix cooled rice, broccoli florets and goat cheese in a large bowl. Whisk together lemon zest, juice, honey, garlic and rosemary and toss with rice mixture. Chill (at least 4 hours, preferably overnight) and serve.